Can I set a shared vault (family) to read only? I don't want to get items changed without knowing. Thanks Ben. It somehow looks different or I am looking at the wrong screens. If I open the people list there is no little wheel anywhere. 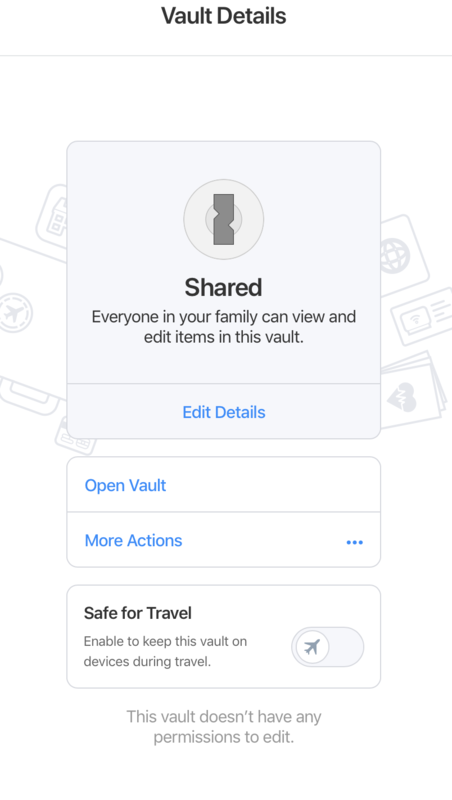 It looks like you're trying to modify the permissions of the Shared Vault - this is a default vault that's meant to be used for full sharing between all of the members of your Family. If you'd like to share items without allowing them to be edited, you'll want to first create a new vault, share it with the Family Members that you'd like to give read-only access to, and then configure their permissions following Ben's instructions. Thanks dbetty! I missed that part about the shared vault. Now everything is as I wanted it to be with a new Vault called Family. Great. Glad to hear that worked out. If there is anything else we can do, please don't hesitate to contact us.